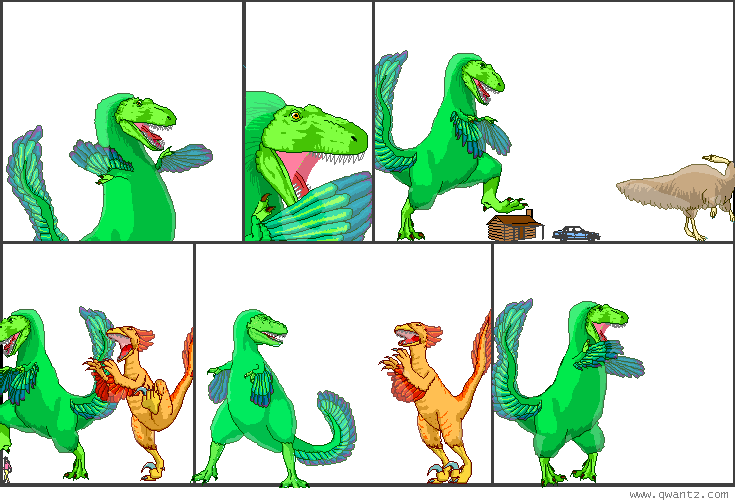 Dinosaur Comics - February 11th, 2008 - awesome fun times! –I guess if they were a crazy racist, that would probably do it! February 11th, 2008: Doondie_man, has, like, an eBay store? Where he sells designs ripped off from other people? And if you click that link you'll see how he stole my A Wizard Has Turned You Into A Whale shirt by literally just taking the image off the website and putting it on a shirt. And he's printed about 60 of them and is selling them for more than what they cost on my site. Thanks, Doondie_man! You are why people don't like other people. I made an LJ post about it here with a few more details and pictures. Anyway I tried to email eBay about this but my login didn't work so we shall see. Why do people plagiarize other people's shirts? It's not like you're not going to get caught, Doondie_man. And now even your mom is going to whisper, "Oh, Doondie_man, Doondie_man. Doondie_man. I thought I raised you better." But, in happier news, check out Katy's latest and greatest comic! You might find something familiar about the layout and positioning of the characters. And hey, a few days ago was February 1st, which is actually the 5-year anniversary of me doing Dinosaur Comics. I didn't even notice! What the heck, right? Thanks for reading my comic everyone. I have the best job in the world! Here's to another five years.